Mentioned as one of the top ten places to stay in Mexico by the Lonely Planet Travel Guide. 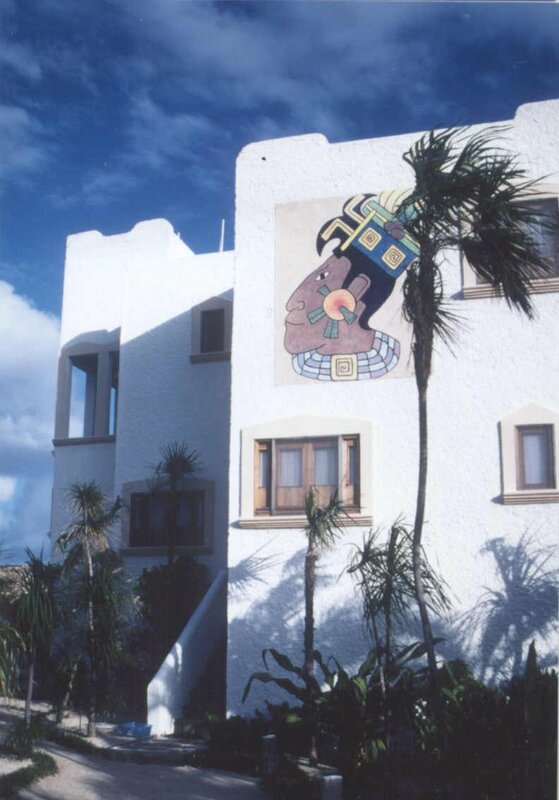 The Hotel Tierra Maya opened in December of 1998. Hotel Tierra Maya (contact information here) is a beautiful self-contained resort not yet discovered by the droves of people that frequent the more popular regions of the northern Yucatan. As they say in their brochure a vacation here is “a union of luxury and casual beachfront living.” This is well said. The airy rooms are very clean containing comfortable beds and simple yet elegant decor. The attention to detail from the maid service, to the architecture to the meals is amazing. There is hot water for showers and fresh safe-to-drink water replenished daily by the maid service. For a relaxing beachfront vacation you cannot beat the quietness, friendliness of the hosts, and amenities of this hotel. Notice the very unique wooden slat chairs that are located on the balcony or next to the entrance of each room. These chairs are very flexible and very comfortable for relaxing in or reading a book. 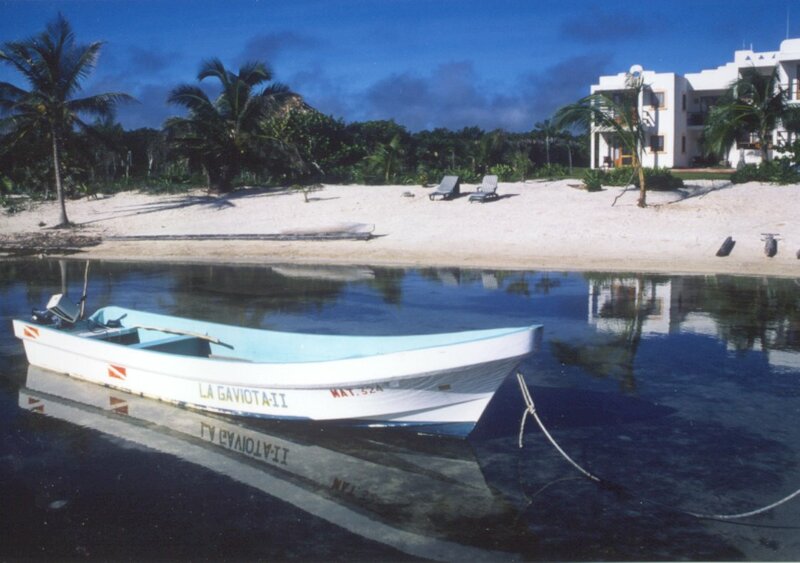 The Hotel Tierra Maya is located just north of the actual town of Xcalak, and is situated on its own private beach. Its about 1 mile north of town on a unimproved dirt road that is passable by car. Take this drive slow and you will be fine – just keep an eye out for potholes. This hotel is run by Kim & David Calkins. Be sure to talk to the owners. They are a great source of information about the area and they have lots of stories to tell. One of the former owners survived a huge hurricane that blew in several years ago. He decided not to evacuate like the rest of the hotel and town, but instead decided to ride out the hurricane in his small boat just offshore. The 140+ mph winds became so strong that eventually he found cover in the mangrove swamps, and was lucky to escape with his life. Ask the owner to discuss how how the actual hotel was built. His stories of the hassles, endless permits and difficulty with material transportation will astound you. I find it amazing that he was able to build such a nice building in such a remote location. This hotel is completely self sufficient and is off the grid. They have a 100,000 gallon underground cistern which contains freshwater which they collect as runoff from the roofs of their hotel. They have solar panels which they use to generate electricity. They also have 2 generators on the premise which insures an un-interruption of electricity. Fortunately, the owners opened a wonderful restaurant next to the hotel during December 2000 called the Maya Grill – this restaurant also has an appealing bar. Before their restaurant was in operation you would have to drive back to Xcalak for meals. However, often food wasn’t even served in Xcalak because the restaurants would be regularly closed. This small restaurant seats about 20 people. They prepare the meals by hand and serve excellent fresh seafood dishes – be sure to try to the Conch. The conch needs to be preferably ordered the previous day so that the cook can prepare it properly by soaking it for many hours and then conducting additional preparation. You can also order fresh lobster and several varieties of fish caught fresh by local fisherman. The food here is perfectly safe to eat. In fact it was one of the few places where I did not get sick in the Yucatan! There are several activities you can participate in while staying at Tierra Maya. Several hammocks are scattered around the grounds hanging between the shade of swaying coconut palm trees. There is a good small selection of English books in each room. Reading one of these books in the hammock is a great way to relax the day away. Hammocks are also found in each room. You can stretch them out across the room. There is an extremely long wooden narrow pier extending far out into the water from the shoreline. At the end of the pier on the left side as you face the ocean is a railing and a set of steps that allows you to easily enter the water. The water isn’t very deep (about 3 feet), even this far out. 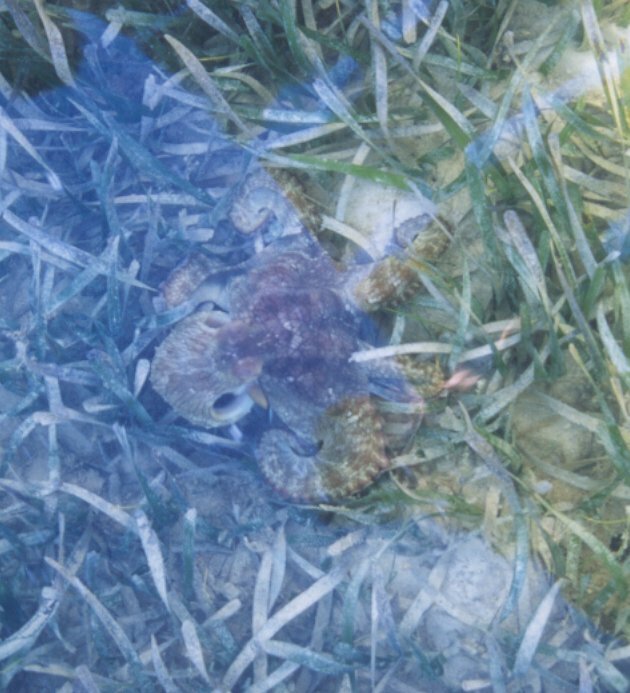 (Photo of octopus was taken next to the pier. A neat experience is to walk out on this narrow pier at night without a light with just the stars overhead. Then lay face up on the pier and watch shooting stars. There is a warm breeze blowing and you are very relaxed. You realize that this is a great way to start a vacation. There is a bright yellow Kayak on the premises free to use for hotel guests. Kayak out to the coral and look for schools of brightly colored fish on your way. Most likely it will take you longer to kayak out to the coral (took me about 35 minutes) then when you return. The winds always seemed to be blowing inland and I made it back to the shore in about 15 minutes. Regardless, kayaking is great upper body physical exercise. If you’ve never used a Kayak before have someone with experience give you a quick tutorial. It is fairly easy to use in calm weather. There are several bicycles that you can use courtesy of Hotel Tierra Maya. I enjoyed biking into Xcalak with my camera. Note the bridge that you have to cross just before entering Xcalak. Then note the terrible looking bridge right next to the main bridge. This broken-up bridge was photographed by the press immediately after a nasty hurricane that came through Xcalak several years back. The photograph was then published in the local newspapers. A bike is a great way to see this town and interact with the villagers. I cycled up and down the small unpaved streets waving to the locals and laughing with small children who just wanted to have their picture taken. During the “golden hour” there will be many great photographs in this town just waiting for you to find and capture them on film. The actual town is in a bit of disarray with several abandoned wooden buildings. Do not expect to find any banks, gas stations, or Internet Cafe’s. As far as I could tell this town remains little touched by any modernization. Near the town is a large pier which people use to unload their boats or for fishing from. You can ride your bike to the end of the this pier, from which you have great views of the shoreline. You can see where the Hotel Tierra Maya is located from the end of this pier. 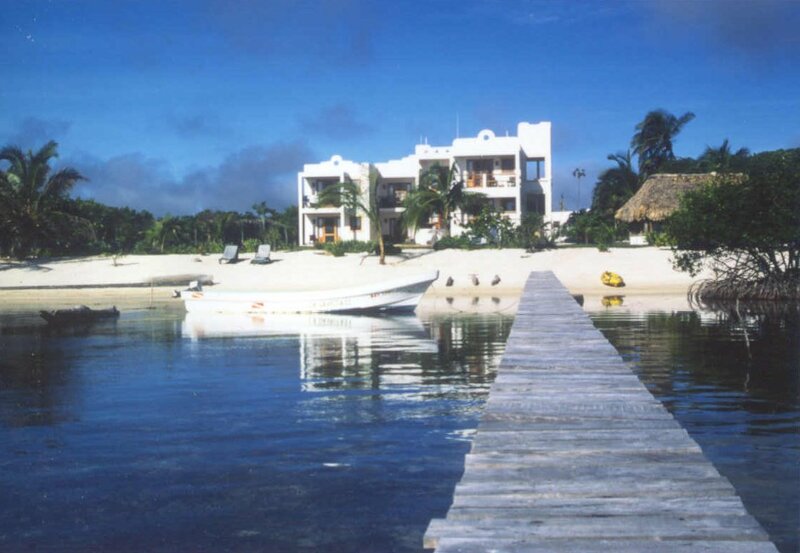 You can arrange sightseeing or snorkel trips by boat from Hotel Tierra Maya. A neat trip is to take a boat ride south of Tierra Maya along the Belize Mexico border through the mangroves. There are some large birds you may see perched on the top of the mangroves. Also keep one eye looking over the boat when you are in the mangroves for the many types of fish that swim in the channels. If you are lucky you may spot a large manta ray effortlessly gliding through the clear water. There are some excellent snorkeling opportunities located near the offshore reef near the Belize/Mexico border. Have the guide take the boat out to the offshore reef and drop you off for a while so you can experience the magic of these waters. You can arrange fishing trips from the Hotel Tierra Maya. You can choose from a variety of options ranging from several hours off shore to an all day trolling trip to even a trip overnight. Coconut cutting without the proper tools is a favorite past-time of mine. Somehow I find a strange challenge in cutting through a thick layer of coconut husk with a pen-knife. There are many coconut palms that grow along the beach in this area. First you have to remove the coconut from the tree which can be a challenge in and of itself, especially if the coconut you desire is 20 feet above you. I recommend finding coconuts that you can reach from the ground. Without something sharp to cut the coconut from the tree you may have to spin it many times around before it will actually break from the stem. The actual coconut is surrounded by a thick green or reddish husk (color of husk depends on age of coconut). Even the small green coconuts are edible – they just have an unripe taste. I usually have a Swiss army knife and I can spend hours slowly cutting away the husk to eventually reveal the hard coconut inside. This is mind numbing work, yet at the same time is quite relaxing. There is nothing quite like the satisfaction of after an hour or two of work being able to taste the refreshing coconut milk, soon followed by the nibbling of the chewy meat inside. When on vacation I find pleasures in simple things. Rates are higher during Easter & Christmas weeks. Luxury & Studio apartments also available. Please note that these prices are in US dollars and they are subject to change without notice. There is a 12% mandatory government tax that will be added to the above rates. – Visa and MasterCard are accepted. Additional guests are $20 per night regardless of the time of year you visit.